FLAG NAZIS IN THE USA's GROWING "PLEDGE OF ALLEGIANCE" POLICE STATE ? In 1898 the New York state legislature was the first in the nation to pass a statute forcing children in government schools to robotically chant the socialist's pledge. In 1905, as many as 19 States had passed school flag laws. To this very day New York still has a law forcing teachers to lead a recitation of the socialist pledge in socialist schools (government schools). Many of those laws are cited at the end of this article. U.S. v Wonschik argued that if jurors feel that they are forced to recite the Pledge, then criminal defendants are denied a fair trial due to the appearance that the Judge favors the prosecution. Jurors were taught by the government that they are required to render verdicts of guilty based on evidence in cases where many people believe that jurors should always render verdicts of acquittal regardless of the evidence (medical marijuana, gambling, vices, prostitution, drugs, gun possession, and all non-violent consensual activity that is criminalized) - cases that should not involve criminal charges at all. Government schools never teach jurors about nullification and jury pardon (the power jurors have to acquit regardless of the law and in rejection of the law). A Pledge of Allegiance in a courtroom merely reaffirms the non-libertarian indoctrination that most jurors have received all of their lives in government schools. The Pledge of Allegiance is a submission by individual Americans to their leiges, acknowledging each elected politician as that American's liege, to whom that American individual must submit under modern feudalism and the USA's growing police state. It is a modern manner for each American to address every elected politician as "my liege." In 1942, after the USA entered the war against Germany, the salute changed from the stiff-arm salute to the hand-over-the-heart. The change was form over substance. Children in some government schools (socialist schools) were taught that, henceforth, placing the right hand over the heart would replace the previous blind obedience represented by the old stiff-arm salute used by German National Socialists that the children were forced to perform in the past. At that time, they were still expelled and persecuted for refusing to participate, even with the "new and improved" ritual. Back in 1988, after Democrat-socialist Dukakis and Republican-socialist Bush acquired their parties’ presidential nominations, Bush began complaining loudly, and to great effect, that Dukakis was against the Pledge of Allegiance. He almost never failed to bring up the subject on the stump. As governor, Dukakis had asked for a court ruling on the constitutionality of a bill passed by the Massachusetts legislature that would require teachers to lead their students every day in the pledge. Some people are either religiously or morally opposed to pledging allegiance to objects. The state attorney general and the state Supreme Court determined the bill was unconstitutional, citing a 1943 ruling by the U.S. Supreme Court. Dukakis vetoed it. 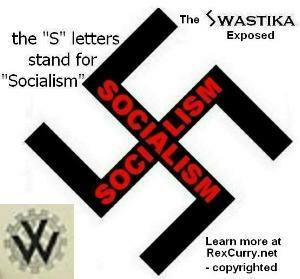 So Bush and his campaign used the opportunity for republican-socialists to promote the socialist's pledge. Previous to Flag Day, June 14, 1923 there were no national regulations governing display of the United States Flag. It was on that date that the National Flag Code was adopted by the National Flag Conference which was attended by representatives of the Army and Navy which had evolved their own procedures, and some 66 other national groups. This purpose of providing guidance based on the Army and Navy procedures relating to display and associated questions about the U.S. Flag was adopted by all organizations in attendance. A few minor changes were made a year later during the Flag Day 1924 Conference. On June 22, 1942 Congress passed a joint resolution which was amended on December 22, 1942 to become Public Law 829; Chapter 806, 77th Congress, 2nd session. There were rules for use and display of the flag (36 U.S.C. 173-178) as well as associated sections (36 U.S.C. 171) Conduct during Playing of the National Anthem, (36 U.S.C. 172) the Pledge of Allegiance to the Flag, and Manner of Delivery. 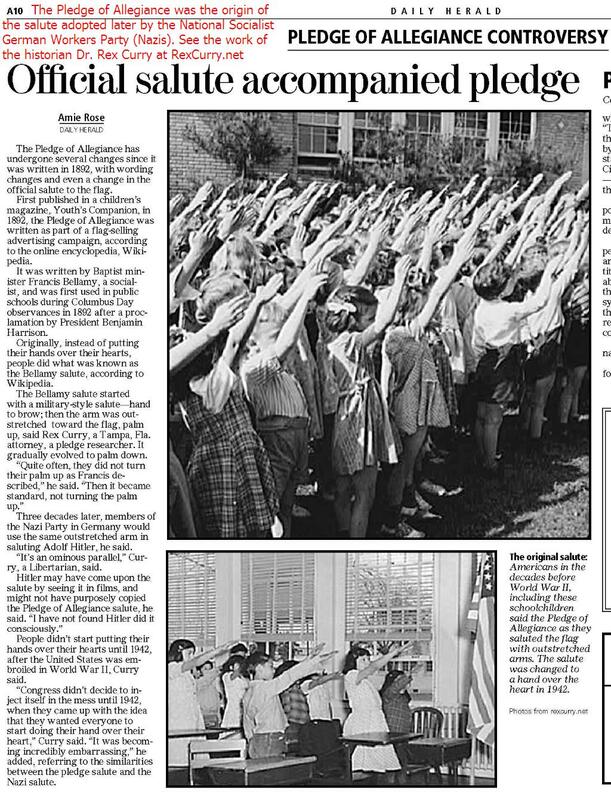 The change that occurred on June 22, 1942 retained that part of the "Bellamy salute" that involved extending the arm toward the flag (although the gesture was initiated with the hand over the heart, in place of the military salute). In other words, the first thing that Congress did was ADOPT the raised-arm gesture, and enshrine it in law as an official gesture of the USA (another scary parallel to German National Socialism under Franklin Roosevelt). The U.S. Flag Code was passed by a joint resolution in Congress, Public Law 829 (Chapter 806, 77th Congress, 2nd session). The code, inter alia, contained the raised-arm salute (following the lead of the 1924 Flag Day conference). Section 7, Pub.L. 77−623, 56 Stat. 380, Chap. 435, H.J.Res. 303, enacted June 22, 1942. (WITH the Bellamy Salute) - "That the pledge of allegiance to the flag, ‘‘I pledge allegiance to the flag of the United States of America and to the Republic for which it stands, one Nation indivisible, with liberty and justice for all’’, be rendered by standing with the right hand over the heart; extending the right hand, palm upward, toward the flag at the words ‘‘to the flag’’ and holding this position until the end, when the hand drops to the side. However, civilians will always show full respect to the flag when the pledge is given by merely standing at attention, men removing the headdress. Persons in uniform shall render the military salute." A later change dropped the extended arm gesture. Section 7, Pub.L. 77−829, 56 Stat. 1074, Chap. 806, H.J.Res. 359, enacted December 22, 1942. 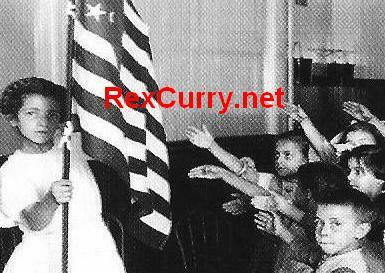 (WITHOUT the Bellamy Salute) - "That the pledge of allegiance to the flag, ‘‘I pledge allegiance to the flag of the United States of America and to the Republic for which it stands, one Nation indivisible, with liberty and justice for all’’, be rendered by standing with the right hand over the heart. However, civilians will always show full respect to the flag when the pledge is given by merely standing at attention, men removing the headdress. Persons in uniform shall render the military salute." Also see 4 U.S.C. Section 1-4 et seq. The Code states that the President of the United States can alter, modify, repeal or prescribe additional rules regarding the Flag. No federal agency has the authority to issue official regulations dictating flag use for civilians or civic groups. 35 states attempt to accomplish what the Constitution forbids by requiring teachers to "lead students” in the pledge on a daily basis. Six other states “encourage” their schools to provide a daily recitation to willing students. One state, Texas, requires not only a daily salute to the American flag but also a separate salute to the flag of Texas. Hawai‘i is one of only eleven states without a statute requiring or encouraging a daily salute to the flag in public schools. Hawai‘i’s Department of Education has no policy on the pledge. The decision is left entirely to individual principals and teachers. The director for civil rights compliance at the DOE, Tom Yamashita, emphasizes that teachers who lead a daily recitation of the pledge are instructed to make it voluntary, with no adverse impact on those who choose not to participate. MASS. GEN. LAWS ch.71, §69 (2 003); The law requires students say the pledge every morning. It even imposes a $5 fine on teachers who refuse or forget to lead the students for two weeks. It is another reason not to be a teacher in government schools (socialist schools). Betraying one's personal beliefs for the sake of conformity is considered "setting a good example" for impressionable minds in a country meant to value integrity and individualism." But the law has been unenforced since 1977, the year the current wording was passed, according to Kathleen LeBlanc, a legal officer with the state Department of Education. That's because forcing students, or teachers, to say the pledge violates a different American institution: Freedom of Speech under the First Amendment of the U.S. Constitution. If students don't want to say the pledge, they don't have to. They can sit quietly at their desks or, in some schools, may continue their conversation over the rest of the class. If a teacher doesn't want to say it, he doesn't have to. A student volunteer can lead the pledge, or the principal can recite it over a loudspeaker. All that Massachusetts public schools have to provide is the opportunity to say the pledge daily. How much kids learn about the pledge is all at the discretion of their individual teachers. TEX. EDUC. CODE §25.082 (2 003); The state of Texas has its own state pledge, too. In 2003, the Legislature required all schools to pledge allegiance to the U.S. and Texas flags and observe a moment of silence every morning at the beginning of classes. Texas' state pledge started in 1933. 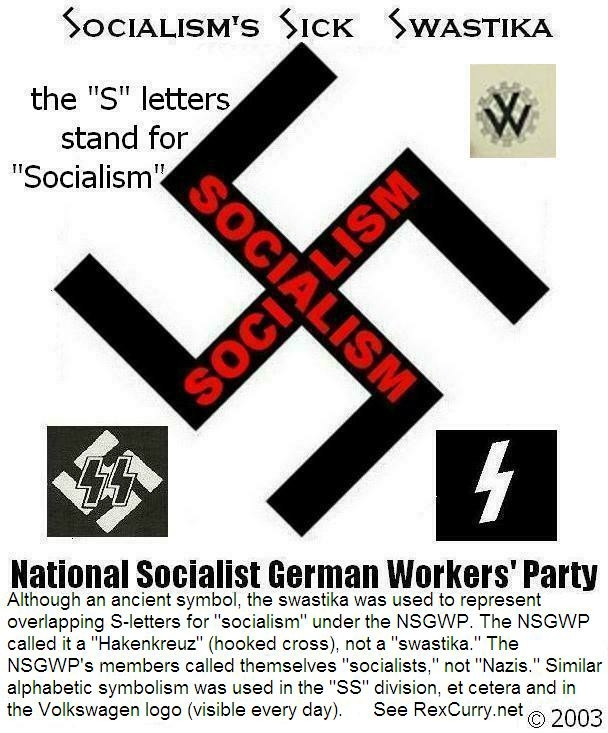 That year is the year that the National Socialist German Workers' Party followed a similar path to dictatorship. It is also a good bet that the Texas pledge in 1933 used the stiff-arm salute, as it was then the salute of the USA's national pledge (from 1892), and it was the origin of the salute of the National Socialist German Workers' Party, along with its chanting and robotic worship of government. Its the state government's version of driving a huge pick-up truck, Hummer, or tank. Can't we just let Texas secede? Or can't we secede from Texas? Foreigners find the pledge fetish in the USA interesting in a "you've got to be shitting me" sort of way. Whilst spending time overseas people used to ask me about it, "do you really salute a flag every morning?" After explaining it away as patriotism most people left it at that. I can guarantee they went away thinking Americans were a bunch of nutters. I hadn't given those past conversations much thought until I reached Austin - the state capital of Texas. Every day I substitute teach at a different school; every day I stand up and say four flag salutes, the Pledge of Allegiance in English, the Pledge of Allegiance in Spanish. Just when you think it is safe to sit down, the classroom intercom or assembly leader chimes in with the Texas Pledge. Then again in Spanish! It's about this time every morning I think of blowing my brains out! Where are we again? I can't believe I am saying this nonsense. To be honest, I can't bring myself to leave my hand over my heart whilst the children are reciting the Texas Pledge. There ought to be laws against such torture. WIS. STAT. §118.06 (2 003). In the U.S., where the stiff-arm salute originated, laws compelled teachers and students to mechanically chant to the flag with the salute every morning on command. It had been a horrid example since 1892. That was in government schools that imposed segregation by law and taught racism as official policy. A fan in Edmonton, Alberta, Canada writes: We recited the Lord's Prayer in unison, aloud, as I recall. Sometimes O Canada was replaced, or added to, by God Save the Queen and even The Maple Leaf Forever (a song whose lyrics are hopelessly politically correct by modern Canadian standards). If I'm not mistaken, it's left up to individual schools whether they want to continue it. There's a school here in Edmonton called Alex Taylor School which serves a multicultural student body, and they still recite the Lord's Prayer. The only objections have come not from those of non-Christian religions, but from liberal so-called "Christians." I don't know what the situation is in some of the other areas of the country. The educational system in Newfoundland was completely divided along denominational lines until just a few years ago, but this was done away with after a referendum, if I recall correctly (another example of constitutionally-guaranteed rights done away with by the stroke of a pen). Quebec was so dominated by the Roman Catholic church that there wasn't even a provincial dept. of education there until 1964. Now the multicult forces are trying to eradicate religious education from the schools there. You won't see a lot of Canadian flags in Quebec, but you will see a lot of Quebec flags. O Canada, by the way, was originally written in French, and I think that even in Ontario when it was first sung in schools it was sung in French because English lyrics hadn't yet been written--this is 100 years or so ago. Every school that I know flies the flag outside, but I don't remember any from my school days that had them in the classrooms. In my mom's day the schools observed 2 minutes' silence on Nov. 11, before Remembrance Day became a holiday. And I remember a few half-day holidays when the Governor-General or a member of the royal family was in town. We don't have colour guards at sports events the way they do in the U.S., although they still perform the national anthem(s) before sports events. I think that's a practice that originated at baseball games in the U.S. during WWI that noone had the good sense to stop when the war was over. The Edmonton Symphony plays O Canada at the beginning of the first concert of each new season. A big issue in this country recently has been CBC's scrapping of the theme music for Hockey Night in Canada after 40 years, which gives you an idea of our national priorities. I remember a colour guard ceremony and the singing of O Canada in my church a few years ago, but that was just because July 1 fell on a Sunday. We don't have annual patriotic celebrations in churches as is often the case in the U.S. There was a bit of a kerfuffle in the House of Commons about 8 or 9 years ago when the opposition tried to make an issue of the fact that individual MPs weren't allowed to have flags on their desks in the House. Other than the political junkies in Ottawa, I don't think anybody in the country knew beforehand that this was the case, or cared.